Pick a date below to see which tours are available. Join our Tour for a full day of Wine Tasting in the Yarra Valley. Experience one of the most delightful day trips we have to offer on a tour of the Yarra Valley winery region. On this 8 hour memorable tour you will visit 4 or 5 of the Yarra Valley region’s finest wineries and cellar doors. You will enjoy tastings of some of the finest local wines, and have a wonderful 2-course lunch. We’ll pick you up from your hotel in Melbourne in the morning (around 9am) and drop you back off around 5:30pm. Your day begins with a pickup from your hotel in the Melbourne CBD area, or public pickup area if you prefer. Then we’ll be off to the Yarra Valley wine region, along the way, we will stop for a morning tea. Then we’ll start visiting some of the regions finest wineries, where you’ll be able to enjoy tastings from some of the finest local wine producers in the region. We’ll then enjoy a delicious 2-Course Lunch at one of the regions finest restaurants. Once we’ve had lunch, we’ll continue on to tour some more of the regions finest wineries before heading back to Melbourne for your drop off at 5pm. All Wine Tours Victoria guides are fully qualified and love to share their local knowledge. We’ll show you the top quality wineries, places for the best produce and all the local landmarks. Each daily wine tour consists of morning tea and a visit to four or five of the regions finest wineries. You will also get to enjoy lunch at one of the top wineries in the area. All this is included in the $180 fully inclusive tour price. Itineraries are flexible and not limited so your favourites can be included. 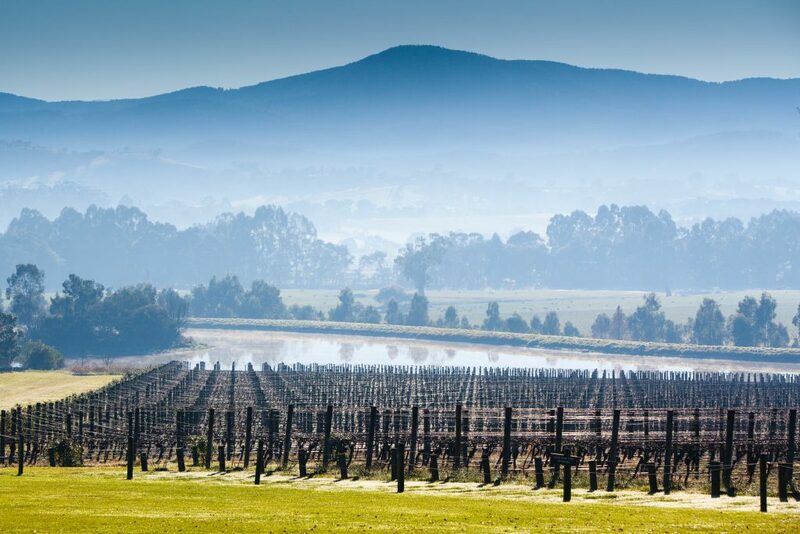 The Yarra Valley has a cool climate for most of the year, making it perfect for top quality grape growing. Wine varieties include Chardonnay, Pinot Noir, Sparkling Syles and a full range of varietals. One of Wine Tour Victoria’s favourite Yarra Valley locations is the Domaine Chandon Winery, where visitors can taste quality sparkling wine. You’ll also be treated to the breathtaking scenery and views for which the Yarra Valley is famous for. During the tour, you will get to experience a range of the other boutique wineries that dot the Yarra Valley. We are regular guests at all of the region’s top wineries, including Balgownie Estate, Coldstream Hills, Rochford, Oakridge Estate, Yering Station, Tokar Estate, De Bortoli, Dominique Portet, Fergusson Winery, Tarrawarra Estate, Punt Road, Sticks, Yileena Park and Coombe Farm. Looking for something more special? Wine Tours Victoria offers special packages so you can experience all aspects of the Yarra Valley. The popular Wine and Wildlife Tour showcases the Healesville Wildlife Sanctuary is a true foodies indulgence. Couples are also catered for with a two day Romantic Vineyard Escape, where you get to really slow down and take your time exploring the whole region. Hotel pickups commence at 8:30-9:00 am for a 9:30am departure. Your exact pickup time will be advised. We had a great time with our Yarra valley wine tour with John as our guide. He was friendly, knowledgeable and patient. He picked us up at out apartment on time, had yummy fruit cake and coffee for breakfast before the first stop. The wineries visited were all great, the lunch we had at Tokar estate was delicious. All in all we had a wonderful experience even though I got sick at the last part. We highly recommend this wine tour company, from the ease of booking and friendly guide, we will surely book them once we’re back in Australia. My sister and I had a wonderful day on the Yarra Valley wine tour. The previous year we went on the Mornington Peninsula wine .tour. The wineries offered friendly service and beautiful wines. Lunch was exceptional. What a fabulous company, we can’t recommend them highly enough. From the ease of booking right through to being dropped back at our Melbourne hotel everything was fabulous. John our guide for the day could not have been more helpful and delightful. The selection of Yarra Valley wineries we visited was perfect and the morning tea & homemade fruit cake YUM! Will definitely be booking another tour with them to try out the wineries on the Mornington Peninsular. Thanks again Trevor & John, we shall be returning. This was my second time ‘touring’ with Wine Tours Victoria and I think I preferred the Mornington Peninsula over the Yarra trip. Both had similar format but the wineries and the lunch were more to my liking on this tour.Our guide Melissa had just the right mix of professionalism and flexibility. We never felt rushed,nor did we feel we had too long at any of the wineries or the wonderful lunch at Merricks General Store.Fun company also made for a great day out….Thanks Melissa and Wine Tours Victoria. Big shout out to Wine Tour Victoria & especially our driver/host John. His knowledge of the Yarra Valley and surrounding region made our day so much more interesting. Its obvious he has a passion for wine and history. On the drive out, John was quick to suss out our tastes and preferences with regards to wines and directed us to some very interesting wineries. We were not disappointed with the venues we visited. Lunch was at the excellent Tokar Estate and we managed to sneak a quick visit into Yarra Valley Dairy, before making the trip back To Melbourne. We would definitely book with Wine Tours Victoria again, but to maybe explore another region next time.